Francois Hollande has questioned the need for so many corporate seats at the London Olympics, saying a French version would be interested in ‘gold, not money’. Expressing surprise at the number of empty places at the Games, President Hollande suggested that rich corporate clients were simply not turning up. Speaking during a visit to London on Monday, he said: ‘The problem is that there are simply too many corporate seats. Mr Hollande confirmed that a number of French cities, including Paris, were likely to bid for the 2024 Olympics after losing this year’s games to London. Just how can you get the newly released tickets? On the official Games website, it states that more tickets will be released on ‘an almost daily basis’ from now on. After you have created an account, you must then search for what sport, event or venue you would like to attend. Once you have selected the tickets you would like – starting price at £20 – you can then purchase them. You must pay using a Visa card, as Locog have a commercial commitment to the company as they are the Games’ official sponsor. Tickets can then be collected from the box office at the various arenas or stadia, or – if the event is later in the Games – you can have them delivered to your home. The box office at the Olympic Park is only for collection of already purchased tickets. People can not turn up on the day and pay for tickets on the spot – unlike at the Wimbledon Championships earlier this summer, when you can pay for a day pass on the grounds. As a result, the tickets are only available online or over the phone as and when they are released over the coming days. But Mr Hollande made it clear that he disapproved of rich corporate clients being given free tickets which they did not use. Most of the events in London have, so far, been blighted by rows of empty seats, with Mr Hollande pledging that this would not happen at a French Olympics. Mr Hollande also enjoyed a joke at the expense of Prime Minister David Cameron, who had promised to roll out the ‘red carpet’ for French people escaping high taxes. In another dig – this time at the Euroscepticism of Mr Cameron’s Conservatives – Mr Hollande also said that ‘it is the results of Europe that will count in the games. Before losing 2012 to London, Paris failed to win the 2008 Games, which were awarded to Beijing. Mr Hollande, who replaced the conservative Nicolas Sarkozy as French president in May, attended a number of events involving French athletes on Monday, before returning to Paris. Mr Hollande is not the only one to notice the sparse population inside the Games arenas during events that should be packed to the rafters. With events beginning on a number of occasions in half-empty stadia, Games organisers Locog and UK politicians – including Culture Secretary Jeremy Hunt – are looking to address the ticket farce to pack out the venues for the remainder of the Olympics. Military troops, teachers and local school children are already lined up to snap up some of the empty seats, and frustration has grown countrywide over the difficulty to get hold of the golden tickets and the huge number of empty seats. 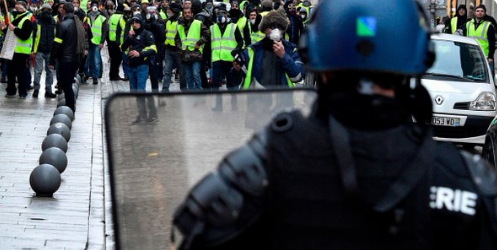 As Mr Hollande alluded to, there are a large number of corporate seats, and part of the problem is that many sponsors and delegates are failing to show up to the events. Mr Hunt hopes to impose a 30 minute rule on proceedings – namely that if you have a ticket and are not in your seat after half an hour of its commencement, you will lose it to be resold. The Culture Secretary is also seeking to obtain more tickets from international sports federations for resale to the public, and told BBC Radio 4 they had received 3,000 extra tickets already. Mr Hunt added: ‘What we’re saying to the IOC and to the international sports federations is if you’re not going to use them, could we have as many possible back because of course we’ve got lots of members of the public who would dearly love to go. ‘We want to be completely upfront with the public, this is a negotiation, we don’t have a right to demand these back. Mr Cameron responded to Mr Hollande’s comments during a visit to Glasgow to promote “the Games legacy” and to back the city’s bid for the 2018 Youth Olympics. ‘There are French medals and there are some British medals too,’ he said. 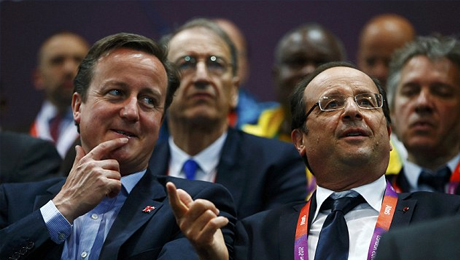 On Mr Hollande’s claim that many Olympics events are not full to capacity because ‘there are simply too many corporate seats’, Mr Cameron insisted: ‘I think there has been a bit of a misunderstanding about the empty seats. Jackie Brock-Doyle, organiser Locog’s communications director, said another 3,800 tickets went on sale last night across 30 sessions in 15 sports and ‘almost all of them had gone by this morning’. Asked if there would be around 3,800 tickets released every day, Ms Brock-Doyle said: ‘No, I do not think we should assume we are going to get to 3,800 every time and obviously, as we get closer to the finals, there will be less availability. ‘It is day by day and it dependson what sessions are available and also what matches are being played. More than two million spectators turned out to watch the first three days of London 2012, organisers said today. Some 856,000 fans, including the football crowds and a ‘conservative’ estimate of 500,000 for the road race, watched on Saturday, with a further 900,000 turning out on Sunday, Locog said. A further 370,000 spectators watched yesterday, meaning attendee rates for the three days were 86 per cent, 92 per cent and 88 per cent respectively. Union flag-waving fans, many with their faces painted, lined the streets between Surrey and London as the men’s and women’s cycling road races took place at the weekend. The party atmosphere on The Mall for the final straight on Sunday, where fans stood 10-deep in places, was boosted when Britain’s Lizzie Armitstead won silver, getting Team GB off the mark in the medals table. As organiser Locog continued to try to resolve the row over empty seats in venues, particularly in accredited stands reserved for athletes’ friends and family, sports’ bodies and sponsors, it said a further 3,800 tickets went on sale last night. Jackie Brock-Doyle, organiser Locog’s communications director, said “almost all” of these tickets for 30 sessions of 15 sports had gone by this morning. ‘I do not think we should assume we are going to get to 3,800 every time and obviously, as we get closer to the finals, there will be less availability,’ she said. Fans would also be able to print their tickets at home after buying them online in future, organisers Locog said. Asked why tickets were not being sold at box offices, Ms Brock-Doyle added: “Mainly because we are selling everything online and we are getting quite long queues of people who are wanting to wait until the tickets become available; they are not becoming available, so it is much easier for us to use the box offices as a collection point. ‘We are also going to start, at some venues, print-at-home. Troops are also being offered the chance to take up empty seats at the last minute, along with schoolchildren and teachers from the local area. ‘A good example was hockey yesterday – Team GB, all accredited seating gone, wasn’t an issue. She added: ‘We made a promise, as you know, at the very beginning that 75 per cent of tickets would go to the British public. ‘We also said after we saw the demand that if people had tickets that they wanted to return we would try and make sure the British public had access to them, and that is what we do. Meanwhile, the British Olympic Association called on the International Olympic Committee today to completely revamp its ticketing policy for future Games. London 2012 has become the latest Olympics to be plagued by empty seats in sold-out events, leading to criticism of the London Organising Committee of the Olympic and Paralympic Games. BOA chairman Lord Moynihan insisted this morning it was ‘time to stop the blame game’, urging the IOC to learn from a problem he said had also dogged the previous three Games in Sydney, Athens and Beijing. Lord Moynihan said: ‘It’s time to stop the blame game and also to recognise that this is such a major and complex issue. ‘Moving forwards, this is an issue that I hope the IOC will take a lead on. He added: ‘This requires huge investment. We’re not talking £100 million-£200 million. ‘The IOC have now got to take the lead and make sure the investment is in place for a state-of-the-art ticketing policy. ‘It is our view that Locog are working exceptionally hard to try to sort out as many of the challenges associated with ticketing as possible. The BOA has yet to raise the issue with the IOC but is planning to do at its post-Olympics debriefing.